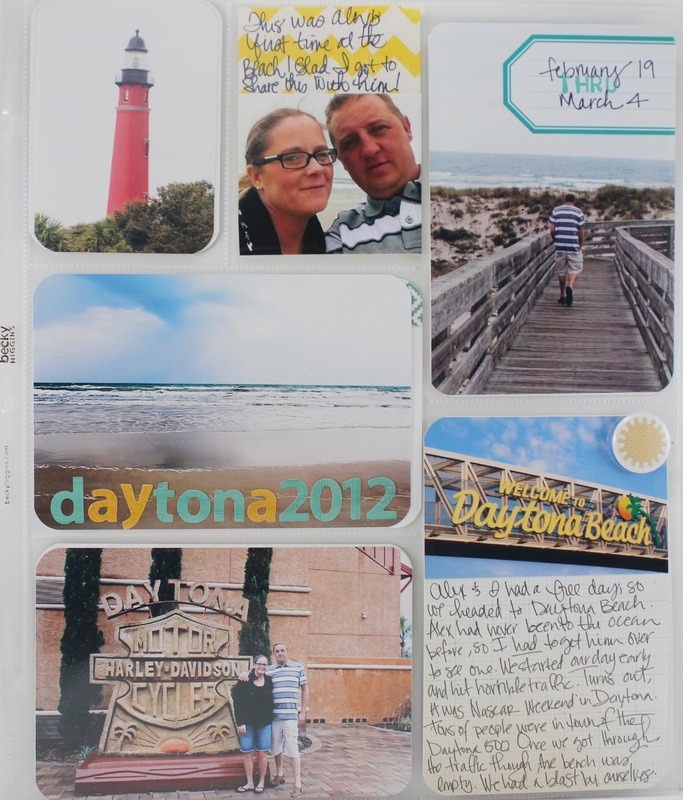 ...and more Project Life layouts! In my book, Week 6 ran from Feb. 13-19. This included Valentine's Day and the 7th anniversary of our daughter passing away. Its always a hard week. 1. Photo of Ben and an award he got at school. 2. Journaling about award. 3. 'M' - journaling about Marcy's Anniversary in Heaven. 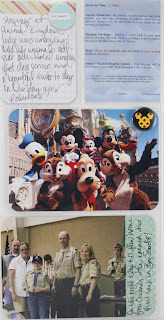 4. Review of week on Elles Studio card. 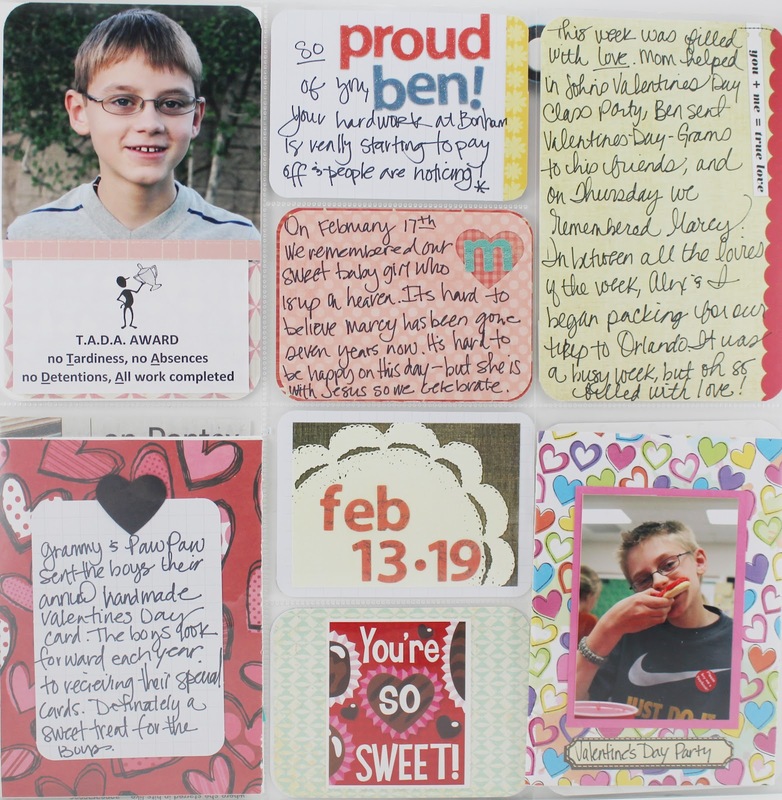 5.background - a handmade Valentines Day card from Grammy & Paw Paw with journaling about it. 6. date card. 7. 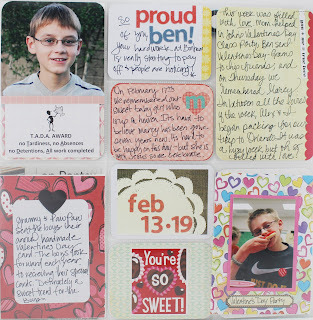 Valentines Day card to Ben from his friend. 8. Johns handmade card from Grammy & Paw Paw and a photo of him at his class Valentines Day party. This was the week of our trip to Florida without the kiddos. (Can you say 'HEAVEN") This week had a ton of photos, so I added an insert. 1. A lighthouse in Daytona. 2. Self photo of Alex and I on the beach. Journaling is written on the back of a envelope from the other side. 3. Date & photo of Alex on a wooden ramp. 4. Photo of the beach. 5. 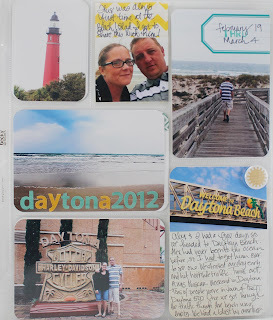 Photo of Daytona sign, along with journaling. 6. Daytona Harley Davidson store. 1. Meeting Goofy. 2. Envelope with private journaling. 3. Cinderellas Castle. 4. Journaling of trip details. 5. Photo of Alex and I at WDW. 6. Me + Mickey Mouse. 1. 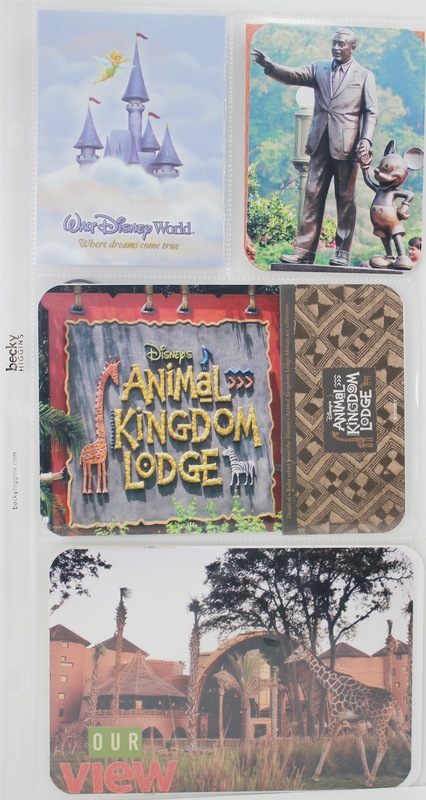 Envelope + hotel key from Resort. 2. Statue at WDW. 3. Sign outside our Resort + tag from the hotel. 4. Our view from our hotel room. 1. Journaling. 2. Trip Itinerary. 3. Photos of characters from WDW. 4. John's Boy Scout Award Ceremony + journaling. As you can see, each individual section is not feel fancy, or heavily detailed. I wanted to highlight the important stuff + move on. I got behind in my documenting at about this point. I just needed to get it done - so for me, that meant using minimal extra embellishments and papers. 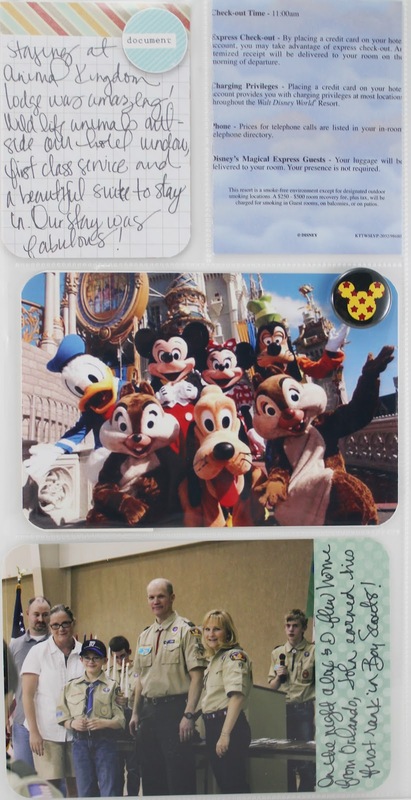 It meant I wrote journaling on small scraps of paper + added labels on photos. Again, this works for me. I am so sorry to read about your daughter. I enjoyed seeing how you covered Disney with PL. We were there this year too and I didn't think to add our key card to it. I am so sorry to hear about your daughter. Had no idea. I love your PL and agree to do it and move on. The trip with just you two looks so fun! Love DW!